These pumps might not look that great as it is but you might be surprised how nice they look when worn. Jennette McCurdy wore these in a few events including the Nickelodeon’s Kid’s Choice Awards in Australia and the recent premiere of Justin Timberlake and Amanda Seyfried’s movie In Time. I have to say it looks way better in both occasions. The thing that initially threw me off was the 1 1/2 inch mirrored platforms but again, it looked way better when you actually wear it. 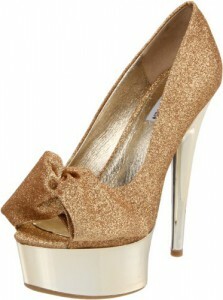 These would look great with tight dresses and maybe chunky silver accessories … except for the gold glitter of course. 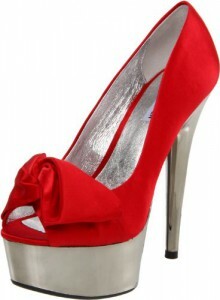 The heel height is approximately 5 1/2 inches with a 1 3/4 front platform. The fabric upper features a knotted vamp that makes it even more interesting. It comes in black fabric, red fabric, coral fabric, blush fabric, gold glitter an multi glitter. The glitter upper costs $99 to $129 whereas the fabric upper design goes as low as$44.98. Buy this Steve Madden shoe here!